Nyala — The leaders of the displaced people in Darfur have publicly distanced themselves from the visit to the South Darfur capital of Nyala by President Omar Al Bashir on Sunday. Ali Abdelrahman El Tahir, the head Sheikh of camps for displaced people in Darfur, said that the displaced did not send any delegation to meet with Al Bashir to declare their support for him as displaced people during his visit to Nyala on Sunday. 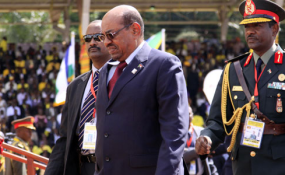 He told Radio Dabanga that "the displaced did not send any delegation to meet Al Bashir in Nyala to speak on their behalf, and that what happened had nothing to do with the displaced". He stressed that as a community leader and head of camps for the displaced, he was not made aware, has not been consulted, nor have all the leaders of displaced camps in Darfur and refugees in neighbouring countries been consulted. He called on the groups in support of the Doha Document who went to meet Al Bashir not to speak for the displaced. "They do not have any status or mandate, represent only themselves, and have nothing to do with the displaced and their just cause of whatsoever," Sheikh El Tahir underlined.